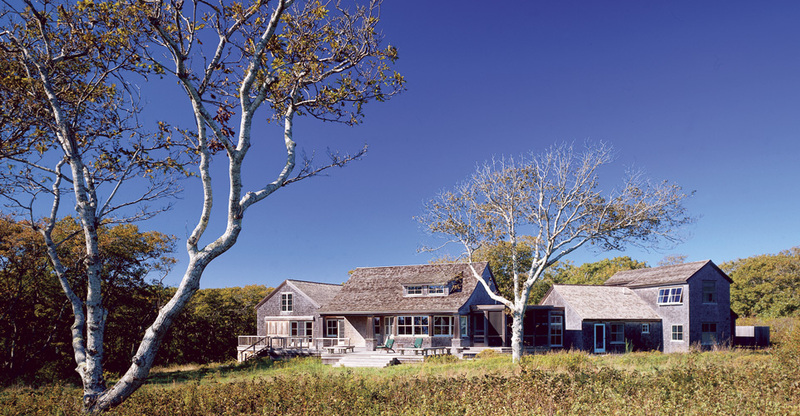 The owner’s desire for an informal, compound-like ambiance, coupled with building height restrictions, dictate the meandering quality of this house, sitting on Wequobsque Cliffs of Martha’s Vineyard. 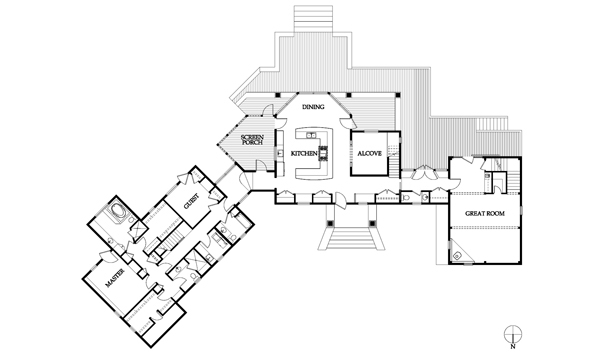 There are three distinct structures: a timber-framed barn / living area, a wood-trussed main house with cooking, dining, and a small, cozy gathering area, and a back house with bedrooms and bathrooms. Connected by short, light-filled hallways and an expansive deck, the three form a gentle arc, embracing arrival on one side, and opening to panoramic vistas on the seaward deck side. Cedar shingles and trim are left to weather; Douglas fir walls and ceilings, antique heart pine flooring, soapstone counters, and custom built-ins maintain a high level of detail and finish.